You are here: Home » Columnists » WHO? Most of these crimes are “black on black”. But the (mostly white) folks in mainstream media don’t seem to care much when people-of-color kill other people-of-color. Killing only matters to them, it seems, when people-of-pallor kill people-of-color. Or when somebody with a name that is readily mistaken for a “white” name kills someone who is black. 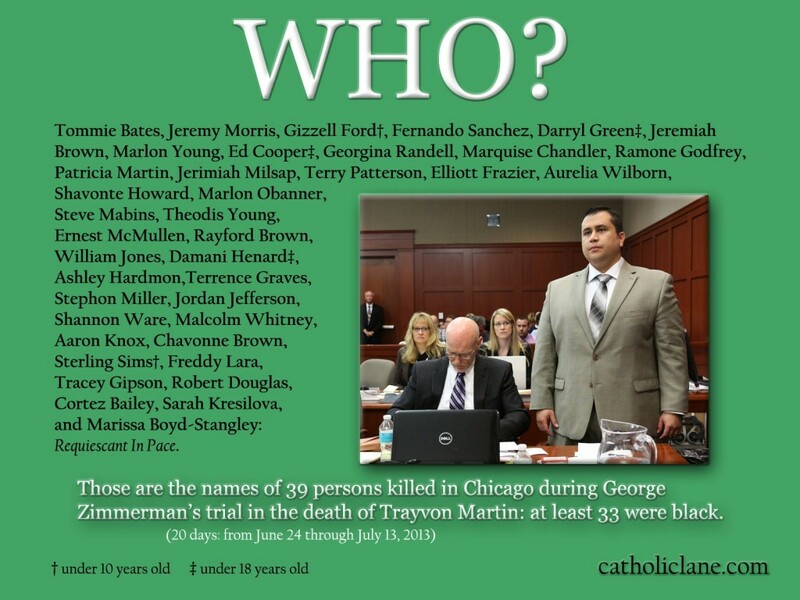 I wonder if Zimmerman went by Jorge instead of George  would we have ever heard of him or Trayvon Martin? The juxtaposition of facts, figures, and imagery here is not meant to imply that the deaths in Chicago happened because of the trial  just that the nation was obsessed with a trial concerning one black’s death while people  mostly blacks  were being killed in Chicago during that same time at the average rate of two per calendar day. Names and other facts are verifiable: spreadsheet via website.